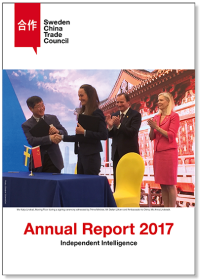 Sweden-China Trade Council’s Annual Report 2017, a more informal report on the activities during last year. The EU–China Business Association (EUCBA) is the EU-wide federation of national non-profit business organisations in the European Union with specialization and particular expertise in exchange of knowledge on investments and trade with China. At current, EUCBA unites 19 members in 19 countries repre­senting more than 20,000 companies – large, medium, and small, in all branches of industry, commerce and the service sector. Sweden-China Trade Council being one of EUCBA’s member organisations. “As the independent voice of European business in China, we seek greater market access and improved operating conditions for European companies”. In 2017, Mats Harborn, Executive Director, Scania China, was elected President of the European Union Chamber of Commerce in China. The 17th WCIF will be held in Chengdu, Sichuan province from September 20-24, 2018 with a focus on the Belt and Road Initiative, BRI, and the development of Yangtze River Economic Belt. During the trade fair, the 6th Sichuan Agriculture Expo, the 3rd China (Chengdu) Emergency Equipment and Technology Exhibition, Western China Digital Economy Exhibition and Western China New Industrial Drivers Exhibition will be held. In May 2017, Chinese President Xi Jinping announced at the Belt and Road Forum for International Cooperation that China will hold China International Import Expo (CIIE) starting from 2018. CIIE will, according to Ministry of Commerce who is responsible for CIIE, give firm support to trade liberalization and economic globalization and actively open the Chinese market to the world. The Swedish government has accepted an invitation from the organizers to facilitate a Swedish country pavilion where Sweden will brand it’s trade and investment climate in a broader perspective. A high-level forum, Hongqiao International Trade Forum, will also be held in conjunction with the CIIE.